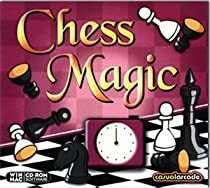 In Chess Magic, complete as many brain-twisting puzzles as you can before you run out of lives. Traditional chess rules combined with fun number puzzles will challenge your puzzle solving skills. In Chess Magic, race against the clock to arrange your chess pieces to form the correct sums. This game features twenty levels with thousands of puzzles – and only six lives to prove your chess and number skills.